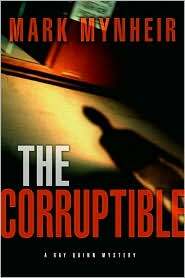 The Corruptible by Mark Mynheir is a great mystery book with the hope of salvation. I'm excited to read the next book in this series and find out how detective Ray Quinn gets saved and redeemed. Even though this book is book two in the Ray Quinn Mystery Series, you don't need to start in book one of the series to understand book two. The main character, Ray Quinn, is a retired police detective who has his own private investigation company, Night Watchman Detective Agency. (If you're like me and enjoy a little sarcasm in your characters, you'll like Ray Quinn.) In our story Ray Quinn is hired by a wealthy (germaphobe) businessman to find company information stolen by an ex-cop. The story gets interesting when the ex-cop, Logan is found murdered. When I first started the book I felt like I was in an old Colombo t.v. episode, but as I kept reading the characters took on a life of their own. Having said that, I have to admit the book did start off slowly for me. Since I did enjoy this book, I'm glad I persevered and continued reading until the story picked up.